Although many of my printing clients are national, I have a large market share of local (West Chester, Exton and Chester County) customers. The phrase is thrown around a lot “Buy Local.” But what does it really mean? What it means is this: You may pay a little more than you would if you went internet shopping, but in the end, is it really worth the savings? I ask this because time really IS money. So the amount of time spent perusing the internet for the “best deal” could be better spent calling on a customer, hugging your child, or calling your mom. What it means is this: Many local business owners donate their time and resources to local non-profit organizations. By putting your dollars in the local economy, you are supporting those business owners who are making your community a better place to live, work and raise a family. What it means is this: Your few extra dollars are giving your neighbor a job! Remember the recession when your friends and neighbors were getting laid off from the “big corporations”? I bet when you saw the foreclosure signs going up, you thought “What can I do to help?” You can keep local businesses in BUSINESS and help them grow, creating more local jobs. What it means is this: If your business cards arrive and they aren’t quite the color you were expecting, how quickly is it going to get fixed? At what cost? Again, time is money…do you want to spend 20 minutes on the phone with someone who really doesn’t understand your business or vision? Next time you navigate to an online printing company to get a “deal”, stop for a moment and think about buying your printing local. Call 610-430-7992 or email us at bluedog@getbluedog.com to keep it local. Keep Up With Doghouse Deals! 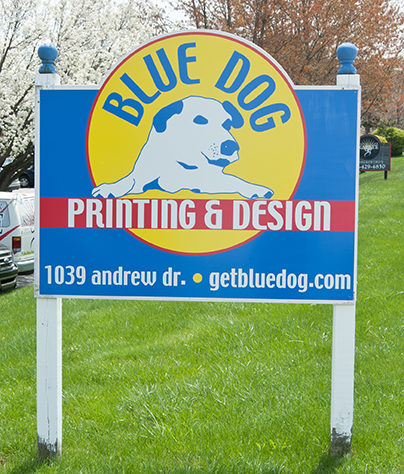 Blue Dog Printing & Design is a printer providing event-in-a-box, marketing strategies, website creation, graphic design, velobind, EDDM, copying, imaging, scanning, direct mail services, digital printing, large format banners and posters, promotional products for businesses and non-profits in the Chester County and surrounding area, including West Chester, Exton, Downingtown, Paoli, Frazer, Chadds Ford, Chester Springs, Berwyn and Malvern.